Architectural Detail ~ A glimpse into the myriad styles of architecture in this world. Yesterday's post was of a small section of this courthouse. This view shows most of it, including the front entrance. 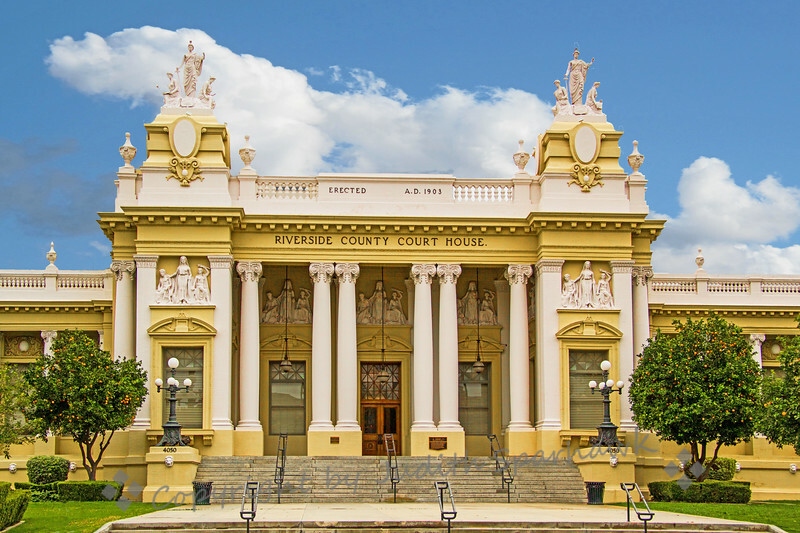 Some of you mentioned the orange trees in front--Riverside has a strong citrus heritage, and even has a Citrus Historical Park. Having the trees in front of the courthouse are symbolic of this heritage. BTW, for those of you who mentioned my changing out he sky (yep.same old dreary rainy sky), I would just suggest not starting out on a building with intricate statuary on the rooftop!